Obituary – Allen, Lovella May (Swearingen) « Perry High School Alumni Association, Inc.
– was born in Grant, Nebraska, and has attended school there, at Three Sands and here. She says that she hasn’t fully decided what lies in the future for her. She is the daughter of Mr. and Mrs. T. J. Swearingen of 1201 Cedar street. In school she participated in the glee club. the student council, the senior play, the operetta and the Red Hots. She was also a member of the Girls’ quartet. She is a swing fan and likes to skate. Also she will play a little baseball. She has held jobs as a waitress, and a household helper during her school years. Lovella May Allen, 71, died unexpectedly at approximately 11 p.m. Wednesday at her home in the Polo community, 12 miles northwest of Perry. Funeral will be at 3 p.m. Saturday at the First Christian church at Perry. Rev. Lynn Scott, pastor, will officate. Burial will be at the Polo cemetery under direction of Brown Funeral home. Memorials may be made to the First Christian church. An investigation was made at the home under Oklahoma’s medical examiner law regarding deaths that occur when a physician is not present. Taking part in the investigation were Bill Ware, Noble county deputy sheriff, and Dr. Jim Knecht, Noble county medical examiner. Death was ruled due to natural causes. A Perry fire department ambulance made a run to the home. Deputy Ware said Mrs. Allen was stricken as she and her husband, Loyd G. Allen, were preparing for bed. Allen made attempts to revive his wife, but was unsuccessful. Ware said the telephone at the Allen home was out of order because of a telephone company project in the area involving change-over from two-party to single party lines. Allen had to drive to the home of his brother, Wayne Allen, to get assistance. Mrs. Allen was born May 2, 1920, at Grant, Neb. Her parents were Jake and Carrie Swearingen. 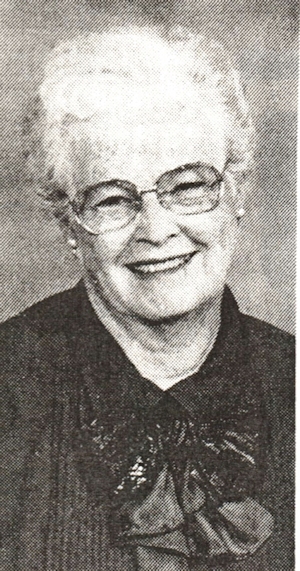 She was a 1939 graduate of Perry high school. 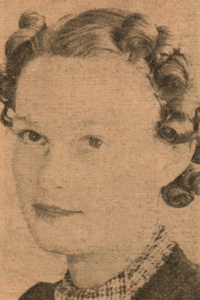 She and Loyd G. Allen were married at Perry, July 14, 1940. The couple left the local area in 1946 and returned in 1980. Mrs. Allen had been a kindergarten teacher for 25 years. She was a member of the First Christian church of Perry and was involved in both church and community activities. In addition to her husband, survivors include two daughters, Mrs. Lew (Janice) Hazelwood, Sulphur, La., and Mrs. Jimmy (Carol) Post, Richardson, Texas; five grandchildren and two step-grandchildren.